Telecommunication engineering opens up many opportunities for the job seeker and telecom sales is just one of the fields, which is increasing its interest day by day among the people. To crack telecom sales interview, one should have technical as well as behavioral knowledge with an adequate fluency as to convince the interviewer. Above all, passion in selling and interacting with the people is the core idea of this field and one needs to have such passion to get the desired result. Here some telecom sales questions are given below along with the answer that will definitely be a great help for people belonging from the same field. 1. Q. What is the GSM service? A: GSM stands for Global System for Mobile Communication, is widely used digital mobile telephony system. It uses the time division multiple access (TDMA) to digitize and compress signal. Generally, it is a standard that defines the protocols which are used in the second generation digital cellular network and that is standardized by European Telecommunication Standard Institution (ETSI). A technical sales engineer must have the clear knowledge in GSM service, as he/she needs to operate independently within the operators’ environments. 2. Q. Explain the VAS service in respect of the sales field. A; VAS (Value Added Service) is the way to promote the services, excepting standard voice call and transmission, to the user. VAS is generally applicable to SMS service, MMS and other services as to make those services interesting to the user. Mobile operator and content provider (the third party value added service provider) supply the VAS to the users for their needs. A sales engineer is responsible for crafting, developing and using the value added service solution on behalf of an operator. 3. Q. What is SS7 networking? A: Common Channel Signaling System No. 7 (SS7) is a global standard to define the procedures and protocol, which are used in the public switch telephone network (PSTN) for exchanging information. SS7 helps in setting up and managing calls between the user and for a telecom sales engineer having knowledge about SS7 is necessary. 4 Q. What are the skills of a telecom sales engineer? 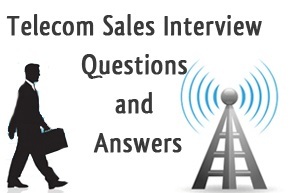 A: A telecom sales engineer has to handle many areas of telecommunication in respect of the sales field. The approaches should be toward a company’s profit so that he/she should have a complete knowledge in customer service ethos. Presenting new technical concept that proves beneficial for the company is also a part of its work area. Skillfully documenting each and every detail as well as handling account is also important. One thing should be remembered that a sales engineer needs to do everything involving customer benefits. A: SMSC is the acronym of Short Message Service Centre, which is responsible for sending forwarding and delivering messages. It extracts the address and then tries to send the message in an exact location. If the message is successfully sent to the destined location, the sender gets a confirmation regarding this and if it fails, then it resends the message in a retry manner. A telecom sales engineer should look after the matter with the sufficient technical support. 6. Q. Explain the job responsibilities of a telecom sales engineer. A: An engineer in this telecom sales field has lots of aspects to look after and among them, project management, especially in the pre-sale and post-sale is a vital thing. Other than that one needs to find out the potential clients who help in increasing the customer network and promoting the product and the services of a company. Besides this, analyzing the requirements of the customer and interpreting it to a company’s beneficial is also an important factor that one should look after. 7. Q. Explain the billing system in telecommunication. A: A billing system is made of a series of independent applications and each one is assigned to perform a specific task in respect of setting up an effective communication. It consists of customer interface management, order management, sales and marketing, rate and plans, and so on. All of which are designed to make the whole process easy for the user and people also can contact with the operator for solving their query regarding various offers. 8. Q. What is the protocol testing? A: Protocol testing is the method of examining the function and performance of a node, a software component that helps in an uninterrupted message flow. The node is tested by a tester, such as Glomosim simulator. Different kinds of nodes are used in a network, including Abacus 500, Etherpeek IP and so on. 9 Q. What is pre-sales analysis? A: Pre-sales phase involves a series of activities regarding the products and offers of an operator to analyze it from the user perspectives. The complete knowledge of the product and its assessment is important to convince the client about its approach. A sales engineer designs the product and prepares the customer presentation in order to explain the technology, the number of components and infrastructure of the product. In this field, client liaison, leadership skill, communication and consultation are some of the ability that an engineer must have. 10 Q. What is the ROI calculation in Telecom sales engineering? A: ROI (Return On Investment) is a major part of a sale so that one needs to calculate it as every company wants to know how much money they return in respect of the investment. The investment is made for developing a certain product and if the ROI is high, it generally attracts the investor and the plan becomes useful for long term. For a sales engineer, the ROI calculation helps to allocate resources as to make the profit.